Hello bargain buddies!! It's Monday, it's Magpie time! I have two items I am very happy with and excited to share with you today, and they actually hail from the same year! 1974. I wasn't born in 1974, but despite never being around for any of the '70s, I have a huge desire to own items that come from that time. Sometimes I have indeed thought that I was a glam rocker born too late... (I blame my obsession with The Rocky Horror Show, ELO and the film Velvet Goldmine) anyway, I digress.. My gorgeous, wonderful Magpie items for this week are a 1974 edition of Boggle and a copy of the first Puffin Annual, also from 1974. 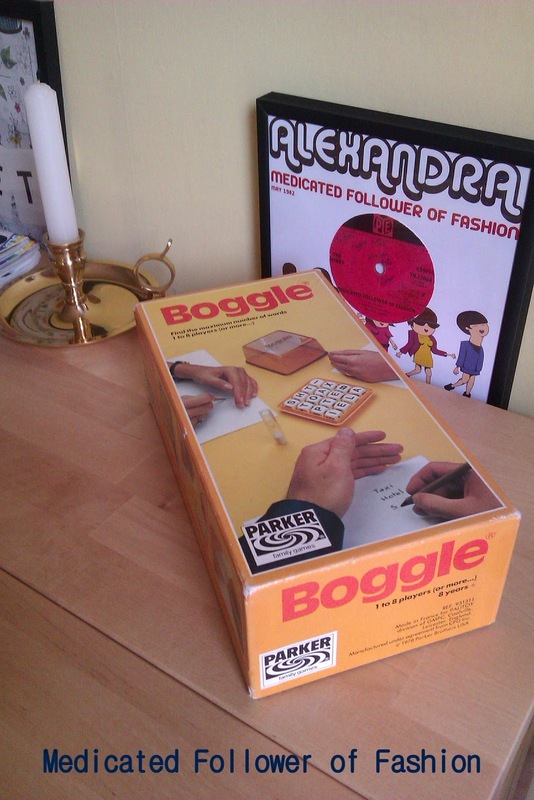 First up, Boggle. Pete and I first got into Boggle on our holiday in Cornwall this year. Both of us had heard of it before, in fact Pete had played it during his childhood. I hadn't though. With little on TV (and who wants to watch TV on holiday anyway?) we fell upon the board games available in our cottage. By far the most fun and challenging was Boggle. We spent several evenings playing and thoroughly enjoyed it. As soon as we came home I began a quest to get hold of a set for us, but me being me, I didn't want to just go out and by a brand new version. I wanted a second hand, pre loved set, preferably one that dated from decades ago.. Why, you may wonder.. Well, I don't know why exactly, but when it comes to board games, I just love to imagine all the people who have played with the set before, the fun times they've had. The thought that this particular set has been entertaining people for 38 years makes me feel all warm and fuzzy. Another bonus with the 1974 set is that the dice are all wooden which makes them wonderful to handle. It's in excellent condition and I feel well worth the £4 I paid (including postage) on eBay. One drawback (though I don't consider it so) is that the 1974 edition is harder than today's edition - the older editions contain more "difficult" letters such as K's making it harder to come up with words. That explains why when Pete and I first played with ours a couple of weeks ago we were only coming up with one or two words in the first few rounds! Either way, I am extremely happy with this magpie find. Second up, my Puffin Annual. I found this treasure in the Nailsea branch of CLIC Sargent. This is one of my favourite charity shops in Nailsea, I'm always finding hidden treasures in here. This beaut set me back £1 and personally, I think it was a pound well spent. I don't believe this is worth very much in terms of money, but I do think it is rich in social and cultural history. The illustrations alone are stunning and the amount to read in there is fantastic. This is a classic example of how little effort appears to be put into today's annuals. I used to love getting annuals at Christmas each year, I was very fond of old Jackie annuals (I remember, oh... the shame.. I had one which had a big "heartthrob" style picture of Noel Edmunds in it which for some reason I found quite "dreamy" *vomit*). I also loved to get Brownie annuals. I don't remember Puffin annuals though. I wonder how long it was made for? Anyway, this gorgeous beast shouted out at me from the bookshelves at the charity shop and I knew it was coming home with me. The stories are a bit too old for Ethan, but in the meantime, I'm enjoying reading them. I think it'll be fantastic when he gets a little older because there are quite a few step by step activities to try out. I just think it's a total gem. It's in impeccable condition as well. The only thing that makes me a little sad? The inscription on the first page - "To Peter, From Daddy, Happy Christmas 1974". Awwww, this just makes my heart bleed a little. I wonder who Peter was? I wonder how this book came to be in the charity shop? I wonder if Daddy is still alive? Was it an ill chosen gift from father to son, a gift that remained on the book shelf only to be donated some 38 years later? Or was it treasured and given away upon a death? To be honest, it's in such good condition, I think it's more likely to be the first. At least my hubby is Peter.. we can pretend it's his. Let's just not mention that he wasn't born until 1982. The front cover makes me grin! Exciting for Moomins fans - Tove Jansson! How to make a ship in a bottle... OK, might do that with little man one day! I feel a little Yellow Submarine-y looking at this illustration! Of course I am linking up this post with Missie Lizzie of Me and My Shadow for Magpie Monday. Do check out the other bargain hunters! I just found your blog via Liz. Love your finds - those Puffin illustrations are fabulously retro - and I'm very envious of that cool Bush radio you pinched off your mum! That Puffin Anual is AMAZE! What a good find. That inscription though, BREAKING MUH HEART. I think I would mull it over too - like you have. It kind of makes your find that bit more special.